Where does the sky begin? What shape is the sky? What colour is the sky? The sky is probably the most undefined and open landscape we can ever imagine. It’s the black surface where the stars appear as small Lighting points. It’s the clear blue environment where the sun shines. It’s the rainy day where the sky falls over us until the horizon gets orange, red and violet. 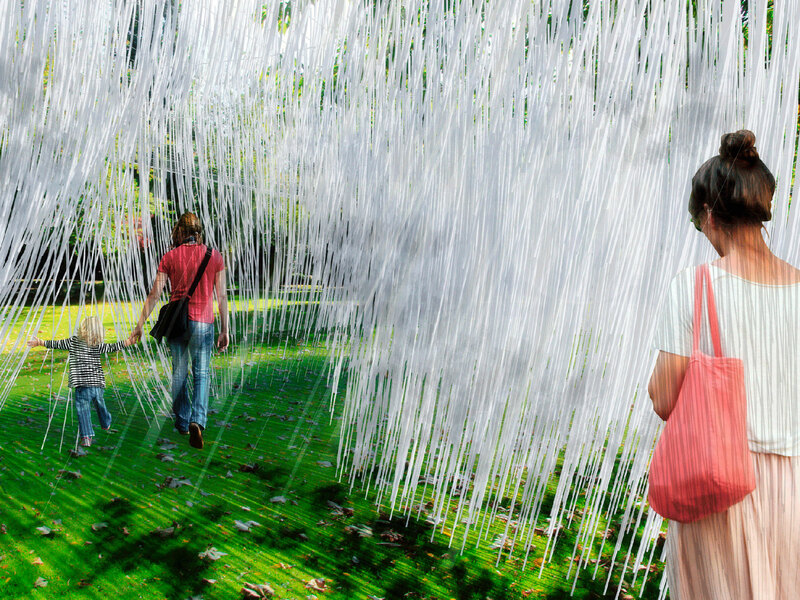 The aim of this proposal is the creation of a space interacting with the sky. A space that has no colour but the colour of the sky. A space interacting with the wind flow. It is to bring a small portion of the sky to the ground. 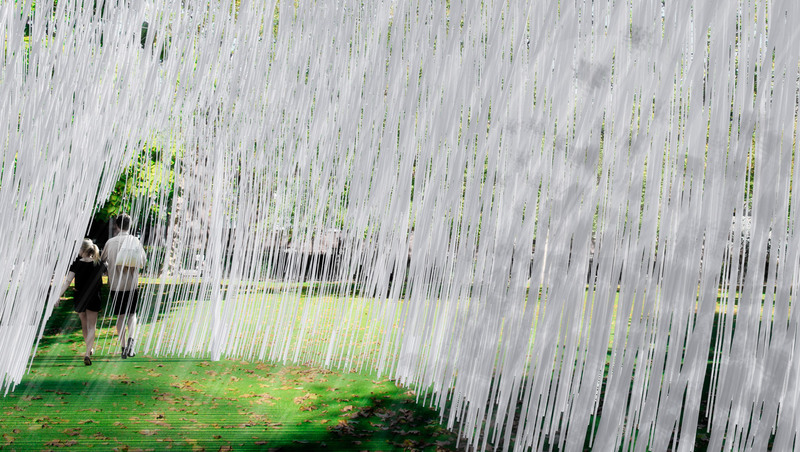 Inside an area surrounded by trees, a pure volume appears as a cloud suspended in the air. The pure geometry it has breaks any connection to the vegetation and lets the wind flow and the sky color become the main characters of this context. The spectator it is invited to approach to the object and discover an internal landscape on it. The Project is a research about two concepts that are main sky characteristics: transparency and weightlessness. 1_Transparency: The sky does not have a specific colour. Even we consider it as clear and blue, it is in fact a superposition of millions of transparent ozone layers becoming blue by the accumulation in the distance. 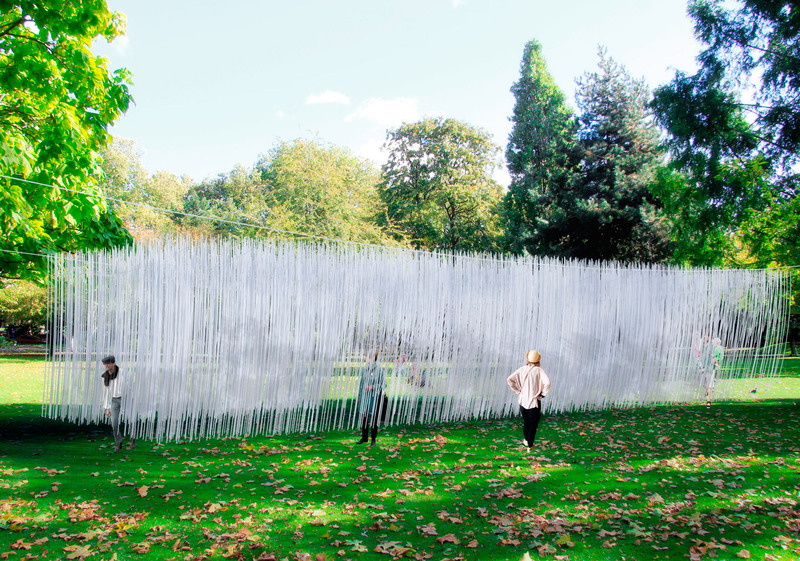 The pavilion imitates this principle by installing multiple small transparent PVC pipes which can reflect the lightning of the sky and adapt the same colour. Big spaces have been left between the pipes to increase this transparency effect. 2_Weightlessness: The pavilion seems to be flying. It gives the sensation of being suspended in the air. That effect comes from the creation of an almost invisible structure with fishing lines. As the pipes do no touch the floor, the wind has the chance of moving them in any direction. That movement shows to the spectator the stage of the sky at each unique moment.